The Rohingya are a Bengali people who are under severe demographic and environmental pressures. As A result, they are spreading out in every direction to find new lives, ranging from New Zealand to Pakistan. They have moved notably into Myanmar, but have also taken to the high seas and wound up in Indonesia, Malaysia, and Australia. More recently, some have been resettled in Pakistan,in the dispute Jammu region. This is an area of dispute wth India. The refugees have arrived via Myanmar and now total about 10,000. Others have settled along the Thai border and still others went to Karachi, Pakistan. Many of course fled back to Bangladesh. The Rohingya are the world's preeminent refugees and a harbringer of receptions people from shrinking islands might face. Repatriation of Royhinga's has been underway for some time. By 1999, some 200,000 were returned. There is a crisis for Rohingya who remain in Myanmar as well as those who live in other countries and their peoples. They have also become involved in criminal activities, not surprising given their state. They have also been victims of criminal activities. Many live as hostages. The Rohingya roots are in dispute. They are Muslim and Caucasian that differentiates them from the Buddhist and Asian people of Myanmar. Some believe they are indigenous, while others feel they are migrants who arrived as early as the 15th century. Under British rule, migrants from Bangladesh were encouraged to work as farm laborers and their totals gradually grew. Communal violence occurred between the two groups during World War II. Burma's independence in 1948 began a long-standing dispute with the Buddhist-dominated government. About 1.25 million Rohingya live in Myanmar today. "The high number and prolonged residence of refugees increases the rate at which land and resources are used up, a process which accelerates environmental degradation and in turn leads to greater competition between natives and refuges for scarce land and resources." (Lee, S. 2005. When refugees steam: Environmental and political implications of population displacement, Cambridge, MA: Harvard University Press. With the independence of India and Pakistan in 1948, the question of Rohingya nationality arose. The Burmese government declared them non-citizens. The Rohingya are concentrated in Western Myanmar. The Rohingya were officially stripped of their citizenship rights in 1982. They inhabitat western Myanmar, along the Bangladesh border (see Figure 1). Many countries have now received Rohingya refugees. In many ways they have become a stateless people. Because they they have often become "boat people" in thier quest for new homelands, some believe they are a proto-type for future environmental refugees fleeing rising seas. Myanmar under General Ne Win declared in 1982 that the Rohingya were not citizens of the country. This decision set many of the latter events into motion. Bangladesh was reluctant to accept them and re-locating itself was not that easy in a country with strapped resources. 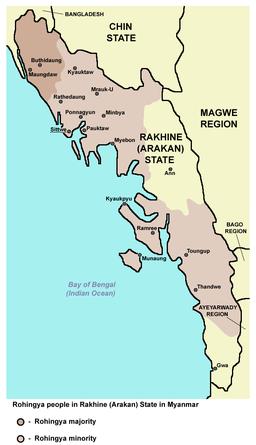 The Rakhine state is located along the Indian Ocean and receives considerable rain per year where the climate is more like South Asia than Southeast Asia. Rohingya are unwelcome in many places. There has been warfare between the two groups for centuries but most was not large scale. The end of the British Empire resulted in new countries with borders that the British had largely erased. They have in the process become one of the least wanted people on the planet. Rahman argues that the repatriation of Rohingya refugees back to Myanmar in actually upsetting internal politics in the country. There are both political and economic aspects of their return. There have been deaths on both sides of the dispute. This is a broad estimate since 1992 that includes several hundred casualties per year that have escalated in recent times. Rohingya die in Myanmar, Bangladesh, in on the high seas. Over 100,000 Rohingya live in camps for internally displaced people in Myanmar. These camps have been cited for atrocities and torture. In Rohingya camps in Cox's Bazar District, which straddles the border area, there is sort of a stateless area. This area has been a place for recruiting by extremist groups. Rohingya refugees have also wound up in India. India has in fact re-settled them in Jamme, the Indian administered state along the Pakistani border. It is a place of constant uprising and tension. Right-wing Indian groups have protested their presence. See Subaina Kumar, "Jammu: Right-wing groups try to evict Rohingya refugees", Al-Jazeera, March 12, 2017. United Nations High Commissioner for Refugees. 2000. The state of the world's refugees: Fifty years of humanitarian action, Oxford, England: Oxford University Press.